Survivor: Redemption Island (2011) - 7th place, 12th out - 6th juror. Voted out in Episode 2, "You Own My Vote" (Day 5). Re-entered the game in Episode 8, "This Game Respects Big Moves" (Day 19). Voted right back out again later in Episode 8 (Day 21). Cumulative totals: In-game - 8 days; Redemption Island - 28 days (2 visits). Redemption Island Ep.1 RC/IC: "Push It Uphill" - Pushes blocks, chops ropes, and Ometepe loses. Redemption Island Ep.2 RC/IC: "Smash, Grab, Smash" - Retrieves keys for Ometepe, but again, Ometepe loses. Redemption Island Ep. 8 IC: "Rollerballs" - Sixth person out, in the three-ball phase (7th/12). Redemption Island Ep. 3 duel: "Jail Break" - First to finish, Matt wins, eliminates Francesca (1st/2). Redemption Island Ep. 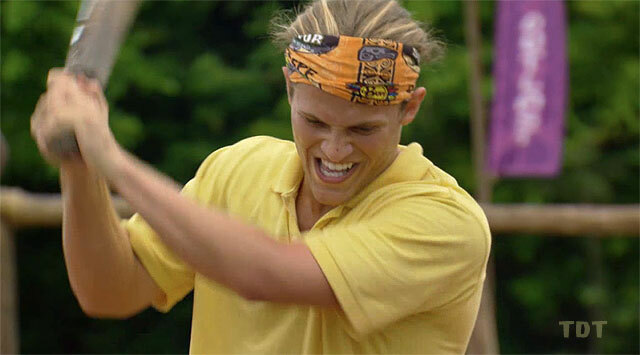 4 duel: "Domino Effect" - Matt wins, ending Russell Hantz's reign (1st/2). Redemption Island Ep. 5 duel: "Cube Crisis" - Matt wins again, eliminates Kristina (1st/2). Redemption Island Ep. 6 duel: "Grapple & Maze" - Channeling Coach, Matt wins! (1st/2). Redemption Island Ep. 7 duel: "Concentration" - Matt wins, Stephanie is out (1st/2). Redemption Island Ep. 8 duel: "Chimney Sweep" - First to finish, Matt wins, re-enters the game (1st/2). Redemption Island Ep. 10 duel: "House of Cards" - Stays alive, barely, in the first post-merge duel (2nd*/3). Redemption Island Ep. 11 duel: "Survivor Shuffle Board" - Matt wins! (1st/3). Redemption Island Ep. 12 duel: "Rock Block" - Matt gets second, stays alive (2nd*/4). Redemption Island Ep. 13 duel: "A Maze N' Jig" - Matt pulls off another second-place finish (2nd*/4). Redemption Island Ep. 14 duel: "A Leg Up" - Falls just short in the final re-entry duel (3rd/4). *Note: Second-place finishes in non-elimination duels count as half a win. Redemption Island, Ep. 2: Four votes, from Rob, Natalie, Ashley, and Grant (voted out, 4-2-). Redemption Island, Ep. 8: Six votes, from Rob, Phillip, Natalie, Ashley, Andrea, and Grant (voted out again, 6-5-1). Good news, Rob! I've decided not to flip on you! Dalton Ross at EW.com (5/16/11): "Matt admits he wasn't there to play the game; talks possible future with Andrea"
Jennifer Still at Digital Spy (5/18/11): "Matt Elrod (Survivor: Redemption Island)"
"Inspiration in Life: I think that there are so many people worthy of being deemed "a hero" in everyday life that are overlooked. So, I'm going to say people who put others before themselves. Why you think you will be the sole Survivor: I'm athletic, amicable and intelligent. I can also hold my own socially. "